As of January 2019, there is only 1 home available for sale in Lake Tuscany in Stuart FL. This home is listed for $449,900 which is an average price per square foot of living area of $125.67. There is 1 home currently under contract. This home was listed for $369,900 or $177.50 per sq. ft. of living area and was on the market for 18 days prior to going under contract. In the past 12 months, 10 homes have sold in Lake Tuscany ranging in sales price from $375,000 up to $543,250. This works out to an average sales price of $454,425 which equals $153.26 per sq. ft. of living area. These homes took an average of 94 days on market to go under contract and sold at 97% of list price. Lake Tuscany in Stuart FL is a newer subdivision just to the west of I-95 in Martin County, Florida. The homes in Lake Tuscany were mostly completed between 2004 to 2005. This attractive subdivision is set up with a gated entrance and all 98 homes in Lake Tuscany are on Panther Trace which makes a large circle around the lake in the center. Homes range from 3 Bedroom, 3 Bath or 4 BR 2 Baths of around 2100 sq. ft. of living area to spacious 6 Bedroom, 4 Bathroom 2 story homes with lofts and theater rooms with pools by the lakeside along with 3 car garages. All are high-quality homes built by local builder Mercedes Homes. 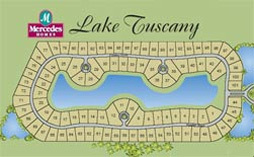 Lake Tuscany boasts lush landscaping and very reasonable Home Owner’s Association fees of $108.00 per month. These fees cover security, the common areas and lake upkeep, basic cable, trash collection and front landscaping. The Lake Tuscany property owners website is located at this site. Families in Lake Tuscany enjoy Martin County’s ‘A’ rated schools in the following schools: Crystal Lake Elementary, David L Anderson Middle School and South Fork High School. Shopping is only minutes away and there’s easy access to Martin County’s waterways and just a short drive to the many public beaches.